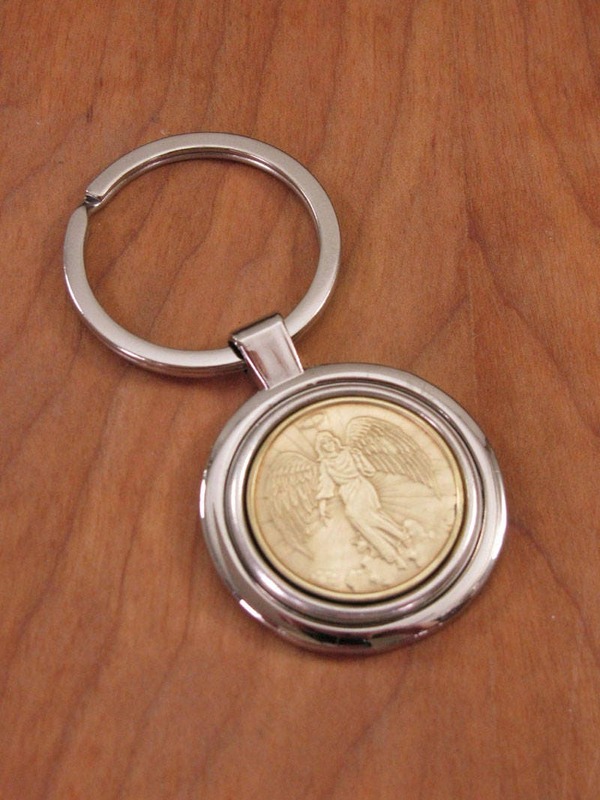 Guardian Angel Coin Key Ring or Key Chain from Key of A® - Great Gift for Him or Her! 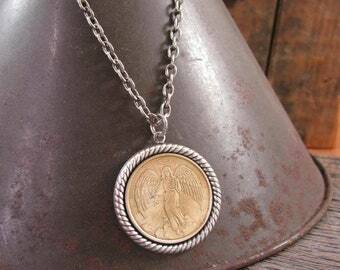 We sourced hundreds of these vintage guardian angel coins and have sold one of our BEST SELLING necklaces for THREE YEARS using them as a wonderful medallion pendant necklace. 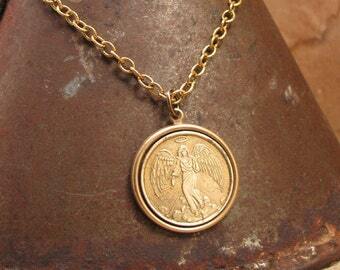 Guardian angel coins and tokens were historically created over the years in many styles and were traditionally given to someone to keep in their pocket so they always had their guardian angel with them. 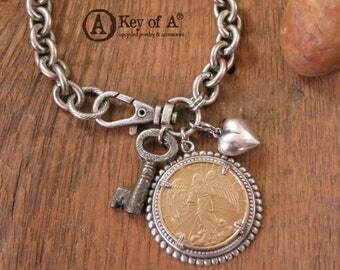 Now we are offering these coins in a key ring style, making them a great accessory gift idea for him or her! These are highly detailed coins in brass that we shined up (note that they are vintage coins, so some may have a bit of patina remaining or a character flaw) and set in a nice antique silver smooth edge bezel. The resulting diameter is 1 1/8" or 29mm, about the size of a US half dollar coin. 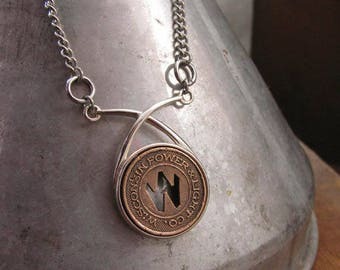 We then mounted the bezeled coin atop the face of our round stainless steel key ring. A perfect fit! Now you can have your guardian angel with you or give one as a gift instead of just handing them the coin which can easily get lost! This gift has a dual purpose! ©2018 The Key of A, LLC d/b/a Key of A®. All Rights Reserved. Was a gift, appreciated by recipient! Heavy duty beautiful keychain!!! Thank you!!! 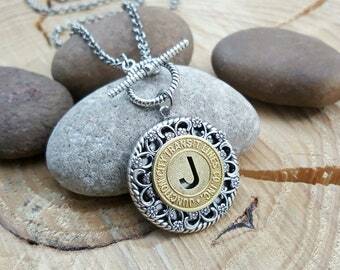 Coin Jewelry - Transit Token Jewelry - Initial J Coin Necklace - Junction City Kansas Transit Token Medallion Toggle Necklace - BEST SELLER!